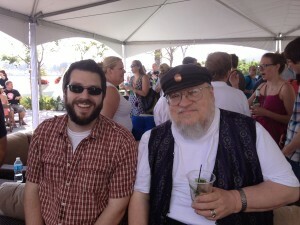 I am still recuperating from SDCC. I will resume drawing Fancy Sketch Drive sketches this week, and start mailing them out as they are finished. There were almost 60 ordered so it’s going to take me a while. I appreciate your patience. 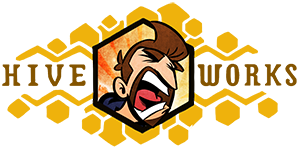 I have a guest comic up at Cyanide and Happiness for my explosm bros (exBROsm, amirite? ), who are also sleeping off one too many a San Diego fun time. 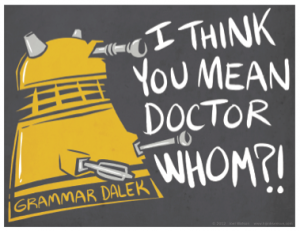 Grammar Dalek Shirts should be going on presale soon. Stay tuned for ordering info. I had an amazing time in San Deiego, but I spent almost no time on the convention floor itself. Normally I am at the booth from open to close every day, but our limited booth space meant that most of the time I was just in the way. 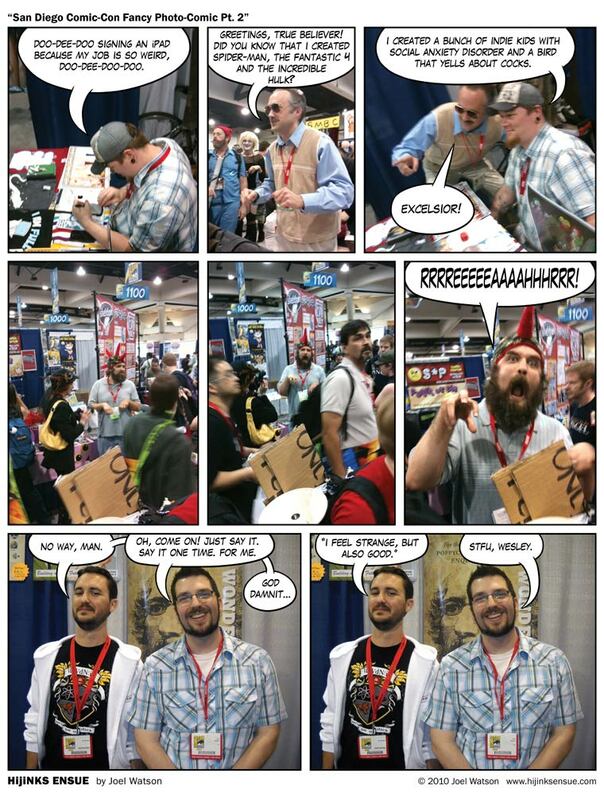 And when I made scheduled signing/sketching times, no one really showed up. It was a very odd convention this year and all of my cartoonist friends seemed to echo the same sentiments. People just weren’t visiting their favorite creators very much this year. I think either A) the show has finally tipped and there are only a small percentage of con attendees who are actually there to meet and buy stuff from comics creators (the rest are their for panels or other big media events) or B) There is so much off site and ancillary entertainment outside and around the convention itself, that most fans are going to the actual show maybe 1 or 2 days to see panels, then exploring the other (free-er) events surrounding the con. For all of these reasons, I spent most of the weekend hanging out with friends, going to parties (especially w00tstock!) and generally having a fantastic time (in which I earned essentially no money and probably didn’t break even on my travel costs, but hey… whatever). I was at (or hovering around) the booth for most of Sunday and oddly enough it felt like a regular convention day. There was a steady stream of fans and sketch requests, and sales. 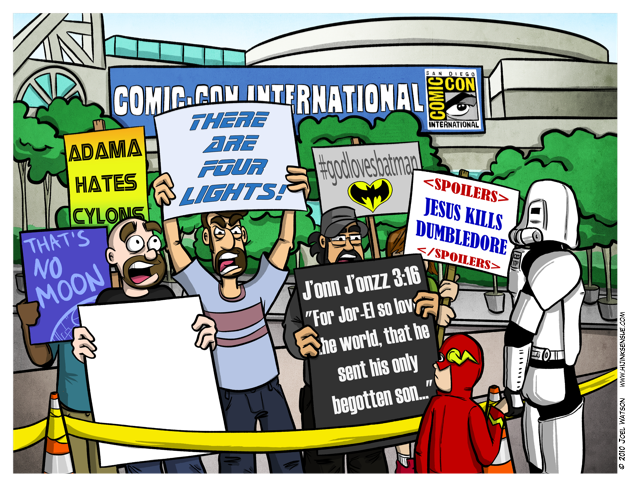 Perhaps the new thing is to save your actual COMIC-coning for the final day. 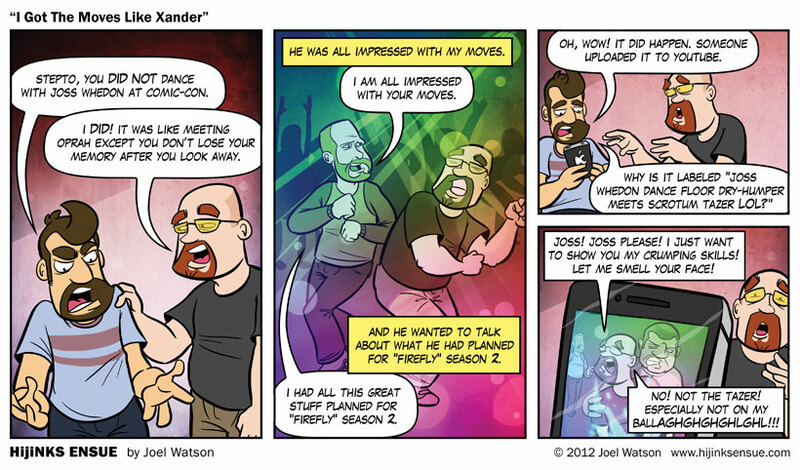 All I can say is that I won’t be surprised at all if many creators take a year or two off after this year. There are far better cons, that cost thousands less to exhibit at, and are far less of a hassle from every angle. I still think I would have gone (and will continue to go) even if I didn’t have a booth or a floor pass. There is just no other time where so many of my friends and professional acquaintances are in one place at the same time. I reconnected with old friends and made some new ones. Chewbacca was at that party. So were Geordie and Data. Life is wonderfully weird. 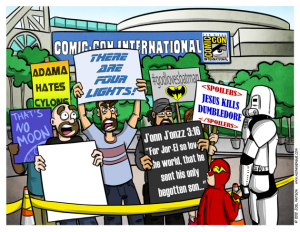 COMMENTERS: What was your favorite/least favorite announcement or news to come out of SDCC 2012? Any other thoughts on the show in general? I am leaving for San Diego Comic-Con in 4 FREAKING DAYS!!!PANIC!!!AHHHHGHGHGH!!! 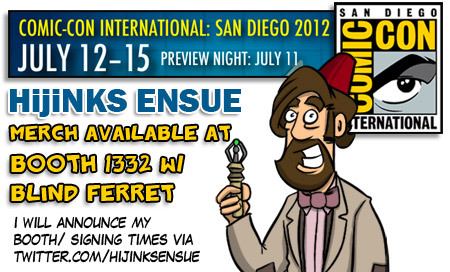 SDCC con-goers will be able to find my merch (t-shirts and books) with Blind Ferret at booth 1332 in the webcomics area. Due to our booth accidentally getting cut in half this year, I will not have table space to sit and draw, but I will be hanging out during the weekend. CHECK MY TWITTER through out the weekend for scheduled booth/signing times. I will have sketch cards and prints with me when I’m at the booth. Since the Grammar Dalek shirts couldn’t be ready in time for SDCC, I am bringing a limited number of Grammar Dalek prints. 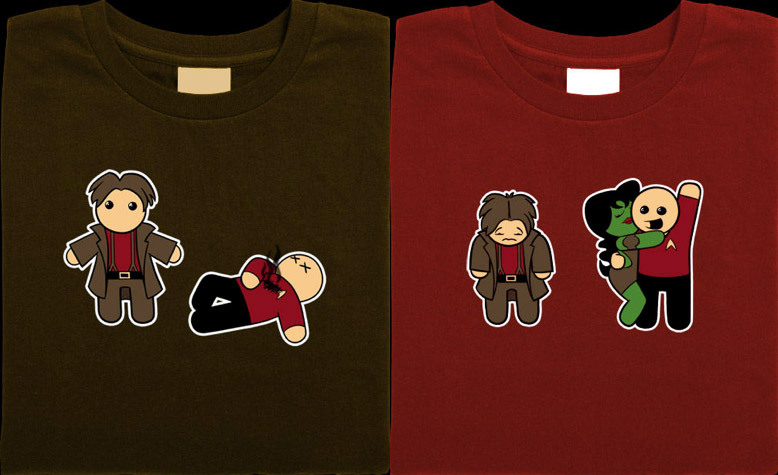 I don’t know if they’ll be on display so you may have to ask me for them if you want one. San Diego is a special kind of chaos that both invigorates me and drains the life clean from every cell in my body. I am going to run 1, maybe 2 new comics during the week of SDCC, then I am going to run sketches from the Fancy Sketch Drive for the rest of the week. Possibly for the rest of my life. I usually don’t want to do much of anything but sleep for about 6 months to a year after SDCC. See you there! If you are a Donation Subscriber, you are A) one of my favorite people, and B) going to get an email today with a link to download the first HijiNKS ENSUE iBook/eBook. It’s called iJinks Ensue: Drawing Hands Is Hard, and it contains all of the HE comics from 2007-2008 plus some neat extras at the end. It will be in iBooks format for iPad and PDF format for everything else. My wife and I have worked CRAZY hard on it, so I really hope you guys enjoy it and understand how much I appreciate your donations. If you are not a donation subscriber and don’t plan to be ($2 a month? C’Mon! ), you will be able to get my eBook offerings on a pay-what-you-want donation model starting later today. Looks like you’re going to have to wait at least one more day to find out what repressed “rememberies” Eli was starting to uncover. I doubt I will get to see the Firefly panel at SDCC since people are probably already in line for it, but thinking about their “huge announcements” has sent me down a certain train of thought. Has anyone else seen Tron: Uprising on Disney? Can’t you imagine a Firefly/Serenity animated series done exactly in that style? The visuals look serious enough that you can take the story seriously. Does that make sense? And it wouldn’t cost $20 million an hour like the movie did. If the crew can never be reassembled for TV or features again, and the occasional comic just isn’t cutting it, doesn’t animation seem like the most logical choice for carrying on the verse? Speaking of SDCC: Due to booth problems beyond my control I will not actually have a spot to sit, but I will be hanging out at the Blind Ferret booth (1332) throughout the weekend. Check my Twitter for signing times and availability. More info HERE. Despite the lack of a table I will find a way to do sketches for you. I’ll probably bring a little collapsable stool or something. NEVER GIVE UP! I WILL SKETCH FOR YOU! Speaking of sketches, money is EXTREMELY tight in HijiNKS land right now, so I am going to do a live sketch drive this week. Starting tomorrow you’ll be able to order custom sketch cards from this site and I will draw them (whatever you requested withing reason) live on Ustream with times to be announced on my Twitter. I’ll probably limit them to 100, but if it’s a success I’ll do it more often. 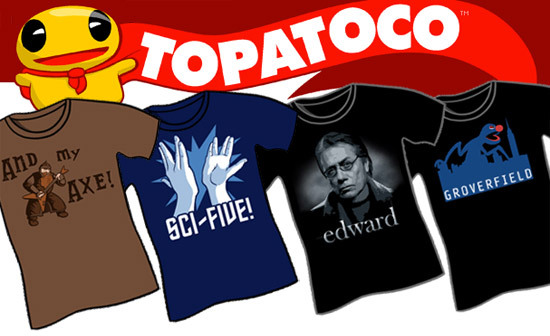 COMMENTERS: What do you hope they announce at the Firefly 10 year anniversary panel at San Diego Comic-Con? Realistically and in your wildest imagination? How about my animated series idea? How would you see that playing out?